The Center of career development was established in 2002. The same year the database of students and alumni who needed an employment was created. This database is continued to be updated and expanded. 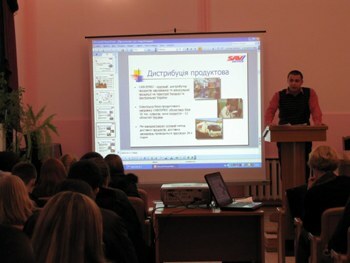 To fulfill the Decree of the Cabinet of Ministers of August 27, 2010 №1726 "On the improvement of the employment level of higher educational establishments graduates" and Order of the Director of ChITE KNUTE of January 25, 2011 №16, the center of career development was reorganized to the Center of Marketing and employment assistance for students and graduates. For the better activization of the activity of the center responsible persons were appointed in charge of the employment of students and graduates at each structural unit in all areas of study. ·keeping in touch with graduates of the Institute. An important point in the preparation of students for their labor activity is the expectations of the employer. Our expectations about "ideal candidate" or "ideal employer" no matter how correct they seem to be, are constantly changing. Therefore, the interaction with the employer, investigation of labor market trends changes, adjusting of joint efforts in students training are key components of the activity of the center.